Kinds of ignition systems - Have you ever wondered why spark plugs can fire? maybe some of you already know that the spark plugs actually do not fire but sprinkle electrical energy. However, from where high voltage electrical energy from ? like a fire tunnel? We know, the vehicle's electrical system uses a battery with 12 volt power. This amount of voltage is certainly not going to issue a displacement in the gap of 0.8 mm. For that there is a series of electrical voltage increase for electricity to be able to get out of spark plug electrodes in the form of sparks. What does that mean? what is the difference? and how does it work? can you see everything in the article below. 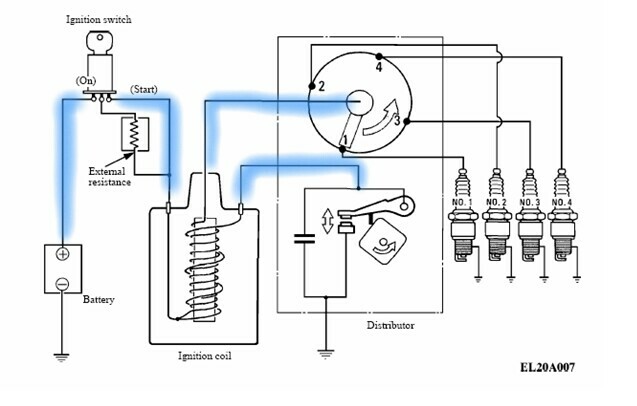 Conventional ignition system is a series of ignition with its performance mechanically. Why is it called mechanically? because in the case of changing the voltage done mechanically by deciding the primary current coil using pont contact. This point contact is also called as platinum because the end of this point made from platinum. Platinum, normally connected to the mass, but if the platinum foot exposed to the cam then the contact will be disconnected. This breaking of platinum contact used to increase the primary stress by means of electromagnetic induction. In addition, to split the spark where live also used mechanical systems using the help of rotor and distributor. This distributor connected to the crankshaft so that when the distributor rotor rotates then the induced voltage distributed to all spark plugs as per the fairing order. 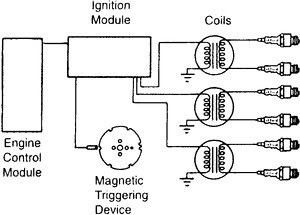 Although using a mechanical system, conventional ignition type is the basis of the creation of a modern ignition system. Currently, it is very rare to find cars with this system because in terms of electrical efficiency lost to modern ignition. The ignition system of a transistor becomes an ignition scheme with an electronic component, but there are still some mechanical components. The transistor ignition system is an electrical circuit that uses a transistor as the primary current circuit breaker. In principle, the system is the same as a conventional system except that the output of the coil primer coil connected to a transistor as an electronic switch. As for dividing the voltage, distributor components are still provided. The semi-transistor type, still using the point contact that used as the base current breaker on the leg of the transistor. The next ignition system is more applied to motorcycles. CDI Ignition uses a capacitor that can store and expel all current quickly. The way CDI works starts when the magnet produces a current when the engine crank spins. The resulting current in the form of AC will be channeled into the capacitor unit so that its current can absorbed. On the other hand there is a pulser that will decide the ignition timing based on magnetism. When the pulsar sends a trigger the capacitor will discharge the entire electric current to the primary coil. Inside the coil the electric voltage magnified again so as to fire the spark plug. 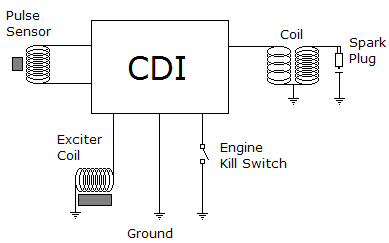 More details can you refer to the workings of CDI motor ignition. DLI stands for less ignition distributor. As the name implies, this system does not use a distributor part. So, how is its performance? DLI is widely applied to modern cars, usually using dual coil pack or single coil pack. In other words, every spark plug served by a coil, so one coil will only increase the voltage for one spark plug. In this case, we have an example, on a 4-cylinder engine there are 4 inputs each of which will give commands when the coil will work. This input generated by ECM with the help of CKP, CMP and some other sensors. Similarly complete articles and details about the kinds of ignition systems on cars and motorcycles, hopefully can add our insight and useful for us all.